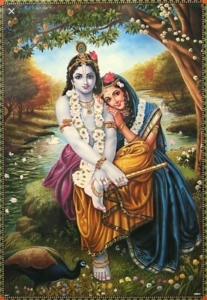 “Love is divine. Love is the greatest force on Earth. It is irresistible. It is love alone that can really conquer the heart of a man….love divine is the only solvent, the one great healer and forgiver.” These are the words from Swami Sivananda about the divine emotion of love. Valentine’s Day – a day to celebrate love; spreading love to our families, friends, and acquaintances by spoiling them with poems, flowers, and chocolate. Yogic and Hindu philosophy goes beyond the expression of love for only those close to us, but for all beings. It is easy to love our family, friends, and those close to us. But do we work to cultivate pure love, without separation and segregation of our judgments? By practicing bhakti yoga, which is focused on pure love for God and all beings, we develop virtues of compassion, patience, and selflessness. Love can heal. The heart chakra, also known as Anahata Chakra, is deeply connected with love and connects the spiritual and earthly transformation. Thus, love can also transform both our spiritual and earthly experiences through cultivating feelings of love. One of the greatest gifts of love you can give is your time. Spend time with your loved ones. Be present. Find and appreciate the beauty in your surroundings, cultivate gratitude for the blessings in your life. Practice Bhakti yoga through mantra, kirtan and meditation. Yoga poses for opening up the heart are also beneficial. You are welcome to contact our team of yoga teachers for further guidance on your personal asana practice. Take care of your body through diet and lifestyle alterations. Nourish your loved ones this Valentine’s day with the gift of an Ayurvedic treatment or consultation. You are welcome to check our selection of gift vouchers online https://www.lakshmiayurveda.com.au/…/books-a…/gift-vouchers/. If you have any questions, please do not hesitate to contact us at info@lakshmiayurveda.com.au. We hope you have a wonderful and love-filled Valentines Day!